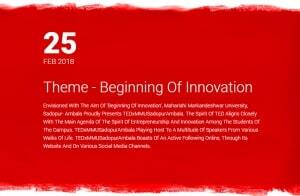 Envisioned with the aim of ‘Beginning of Innovation’, Maharishi Markandeshwar University, Sadopur- Ambala proudly presents TEDxMMUSadopurAmbala. The spirit of TED aligns closely with the main agenda of the spirit of entrepreneurship and innovation among the students of the campus. TEDxMMUSadopurAmbala playing host to a multitude of speakers from various walks of life. TEDxMMUSadopurAmbala boasts of an active following online, through its website and on various social media channels.